In the cold war, a lawyer, James B. Donovan recruited by the CIA and involved in an intense negotiation mission to release and exchange a CIA U-2 spy-plane pilot, Francis G. Powers that was arrested alive after his plane was shot down by the Soviet Union during a mission- with a KGB intelligence officer, Rudolf Abel who was arrested for espionage in the US. “I am Irish, you are German. But what makes us Americans? Just one thing, The rulebook. Spielberg returns to the history of war long after “War Horse“, a story of a stallion with a Lassie attitude during WWI, but not with heroic images of the battlefield as in “Saving Private Ryan“. 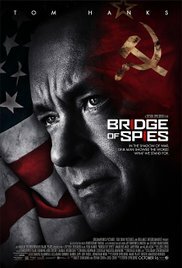 “Bridge of Spies” takes place during the Cold War. A period during which espionage was commonplace and super powers completely distrusted each other. As a result a whole arsenal of nuclear missiles were aiming at the main cities in both continents. Spies infiltrated into society and gave the authorities and agencies all sorts of secret information. And those spies just look like we imagined them. Dignified dressed men with a long coat and a stylish trilby, shyly and cautiously moving through the crowd and revealing a rolled up piece of paper somewhere out of a wall. After that they deciphered this message by means of an ingenious mechanism and a complicated decoding key in their sober furnished apartment. And that message contained the new coordinates where the next message was hidden. Well, in my childhood I imagined it would be like that. The most successful part of this film are the overall eye-catching images and decorations. The setting looks absolutely beautiful with lots of details. The city of New York in the 60s with its boulevards full of beautiful cars, the costumes, the atmosphere and family values in that period. Thus we are introduced to the the family of James Donovan (Tom Hanks). A typical American model family, residing in a house decorated in atom style, elegantly dressed in the fashion of those days and with a disciplined lifestyle. In contrast, a bit later we are witnessing the construction of the Berlin wall that splits this city into two parts. A grim, postwar, snow covered Berlin where heartbreaking scenes take place. Key figure in this espionage drama is James Donovan, an ordinary lawyer who’s specialized in legal cases with insurance companies. From one moment to the other he needs to defend the recently arrested Russian spy Rudolf Abel (Mark Rylance). In those days anyone or anything that has to do with communism is automatically suspicious and should be condemned immediately. This means that this cold-blooded spy can’t count on a fair trial. But they forgot about Donovan, because this principled lawyer believes in the constitutional rule that everyone, no matter what their crime or origin, is entitled to a defense and isn’t guilty until proven otherwise. The result is that the hostile public opinion isn’t only focused on Abel but also on Donovan, someone of Irish descent but American at heart. Did “Bridge of spies” make a huge impression on me? No not really. Not that the perfectionistic images are disappointing. Or that the acting is abominably bad. But because I wasn’t waiting for the umpteenth historical war-documentary. The used clichéd contradictions between the two superpowers was a bit to obvious. For instance, the circumstances of Abel’s imprisonment seemed more comfortable than those of the American prisoners in Eastern Europe. And the cunning way Spielberg bypasses the historical character and gives it a more adventurous and heroic touch, shows that he must make concessions to Hollywood’s management. On the other hand it was a relief to see that the image of a spy is shown in a realistic way. So don’t expect James Bond or Ethan Hunt situations, filled with impetuous action and death-defying stunts while making use of high tech gadgets. The spies in “Bridge of spies” are ordinary characters who perform their “spy-work” in a simple and less spectacular way. And finally, the importance of a star actor such as Tom Hanks is of course crucial for this film.Hanks is and will always remain one of my favorite actors. A charismatic and versatile actor who turns each role into a masterpiece. He dominates in every movie. Without Hanks this would only be a typical historical drama that has taken shape in the mind of the master himself, Steven Spielberg.